Let's face it! Fashion is all about having fun dressing, experimenting new ideas and sometimes taking risks. Well I love doing all these and you probably noticed that today's outfit includes 2 shirts. I don't take credit for this great idea; Taylor Tomasi Hill is the one that inspired me, even though I did some changes by wearing one of the shirts backwards. I loved the idea of wearing 2 different shirts, one from a delicate printed fabric and the other one plain and more rigid. The rest of the look was created in normal standards with the usual amount of colour. This is my nr.3 look and the last from my Joe Fresh collaboration " one pair of denim/ 3 different ways to wear it". You can see the first two Here and Here. Whaaat, that is something new! I didn’t know until the picture of your back that it was literally a collar shirt wrapped around! LOVE the idea and LOVE how it stands on you! Props! Wow, so creative and it works so well. 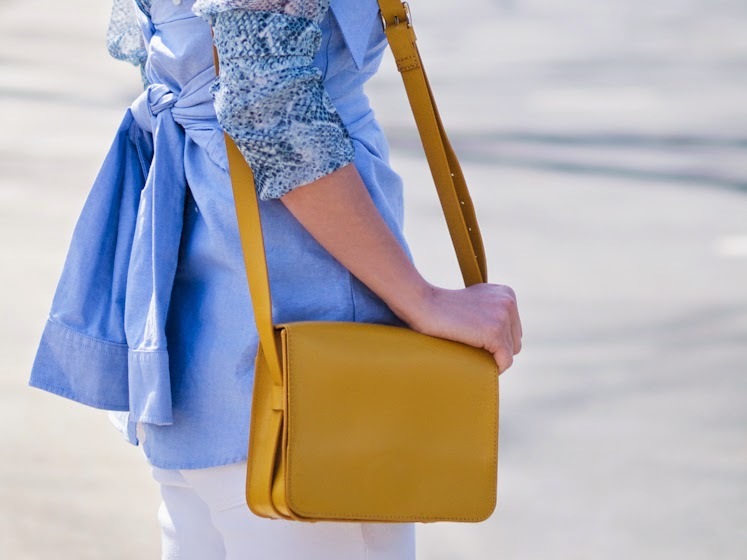 Love the mustard accessories, its perfect for the blue. this trend is reeeally fabulous ! Such a cool and unique outfit!! Love what you did with the two shirts! Great match…perfect combo with the reptile shirt and the blue top. So clever! I love how you made the shirt into a boustier. I will have to try that!